After docking their vessel in a massive Saak'ak battleship (the headquarters of the Trade Federation fleet) and while being escorted to a conference room by a droid, Obi-Wan expressed his concern to his Master: "I have a bad feeling about this...it's something elsewhere, elusive." The apprentice was instructed: "Be mindful of the living Force." The droid reported to his Neimoidian masters who were in charge of the blockade, Viceroy Nute Gunray and Lieutenant Rune Haako (Jerome Blake), revealing that the two ambassadors were powerful and wise Jedi Knights. Gunray decided to contact their evil and mysterious master, Sith Lord Darth Sidious (seen in a flickering blue hologram) who ordered the two Jedi to be killed immediately. [The Sith were ancient enemies of the Jedi.] The Jedis' starship Radiant VII was destroyed, and a Dioxis gas filled the room where the Knights were waiting. With lightsabers drawn, they were forced to fight against ten Battle droids with blasters. They were then faced with two rolling Destroyer droids ("droidekas") with shield generators. They reached the main hangar where they saw that their ship had been demolished, that Battle droids were assembling into an invasion army of the Federation - and they were trapped. 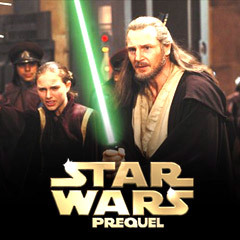 Qui-Gon announced that they needed to warn Naboo and its pacifist Queen Amidala (Natalie Portman) about the impending attack, and also contact Chancellor Valorum. Amidala disapproved of the blockade and complained to Gunray. Shortly later, Naboo's communications systems were disabled - the first evidence of an attack. The Jedi decided to split up, stow aboard separate landing crafts, and meet down on the planet of Naboo. After a successful escape on a Trade Federation vessel, the two Jedi landed in a murky swamp, where Qui-Gon saved Gungan outcast creature Jar Jar Binks (Ahmed Best) from being crushed by a giant Federation troop transport. To protect them from the Federation Army attack, the banished Jar Jar led them, with special breathing masks, to a "safe city" - the hidden underwater Gungan realm of Otoh Gunga composed of giant connected bubble structures. There, the Jedi were surrounded by guards with long electropoles who were riding on huge kaadu creatures. They were taken to Boss Rugor Nass (Brian Blessed), the ruler of the underwater village of Otoh Gunga, who refused a request to help the people of Naboo. However, he offered a bongo submarine transport to help them reach the Naboo capital city of Theed, and allowed them to take Binks as their navigator through the planet's core. Their transport was attacked by a giant sea creature, a huge opee sea killer with a gooey, extended purple tongue. An even bigger sando aqua monster emerged and chomped the fish in half. They lost power, but when it came back, they startled a giant colo claw fish which began pursuit. During their flight, they navigated straight toward the jaws of the sando aqua monster behind them, but avoided the danger as the monstrous fish bit into the claw fish. They continued on to Theed to rescue the Queen from the Trade Defense Forces. The invasion and seige of Naboo by droids and tanks was on schedule. Battle droids had entered the capital city of Theed, taken over the Queen's palace, and captured the Queen. Viceroy Gunray announced: "The Queen and I will sign a treaty that will legitimize our occupation here. I have assurances it will be ratified by the Senate." The defiant and uncooperative Queen (with her advisors) were being taken from the throne room to Camp 4, a detention facility. Suddenly, the two Jedi appeared on a balcony with their lightsabers drawn to successfully attack the Battle droids. The Jedi announced themselves as "ambassadors for the supreme Chancellor." They were then led to Naboo's main hangar to board the Queen's personal Royal Starship, but she at first refused to leave her people. However, she was convinced to join them and travel to the planet Coruscant (the Galactic Republic's capital world), with three of her orange-draped handmaidens, and Theed security force chief Captain Panaka (Hugh Quarshie). She planned to tell the Galactic Senate about the illegal invasion, ask for help, and find a peaceful solution to the dispute. The Queen's transport was sleek and fast, but weaponless and defenseless. At a deadly blockade of the Trade Federation, they were hit by laser fire and lost power to their shield generator. R2 Repair droids were dispatched to repair the hull, all of whom were blasted by the ensuing attack - except for one Astromech droid. The deflector shields were restored, and the ship raced through the blockade into deep space. The commended repair droid was named Artoo-Detoo. Darth Sidious was furious with news of their cruiser's escape and snarled to Gunray: "I want that treaty signed." He assigned his well-trained Zabrak Sith apprentice Darth Maul (Ray Park) to find the Queen and the two Jedi ("Move against the Jedi first. You will then have no difficulty in taking the Queen to Naboo to sign the treaty"). The damaged ship (now out of Federation range), with a leaking hyperdrive was forced to land on nearby yet remote desert planet Tatooine (controlled by gangsterish crime lords known as the Hutts) with twin suns, for refueling and repairs. After putting down on its outskirts, a small landing party of Qui-Gon, Jar Jar, R2-D2, and pretty handmaiden Padme (also Natalie Portman), the Queen in disguise, set off for the spaceport of Mos Espa, filled with some indigenous tribes and scavengers. In search of a new hyperdrive generator, they arrived at a small cluttered junk shop that sold used ship parts, run by blue Toydarian Watto (Andy Secombe) with two stubby wings. Watto owned nine-year old Anakin Skywalker (Jake Lloyd), a dirty mop-headed boy in tattered clothing, and his mother as slaves. They had originally been sold to Gardulla the Hutt, but were lost in gambling on the Podraces to Watto. When Watto refused Republic dataries credits from the Outlander to pay for the needed parts, Qui-Gon waved his hand before Watto's face to change his mind, but the "mind tricks" ploy didn't work on the Toydarian ("No money, no parts, no deal"). The smart little boy Anakin boasted of being a pilot and mechanical engineer who would someday escape the planet. Later, he saw them in the marketplace and saved Jar Jar from getting into trouble with his major podracing Dug rival Sebulba (Lewis MacLeod). Anakin invited them to his slave quarters for shelter when a sandstorm developed, where the group met his mother Shmi Skywalker (Pernilla August). He showed off his inventions to Padme, including unfinished Protocol droid C-3PO (See-Threepio) (Anthony Daniels) - "naked" without a metal covering. Anakin guessed correctly that Qui-Gon was a Jedi Knight, because he saw the laser sword attached to his belt. To earn Tatooine money to buy replacement parts, fast-reflexed Anakin ("I'm the only human who can do it" (pilot a Pod)) suggested that they enter the next day's Podrace (on Boonta Eve), with him piloting his pod for them to win the prize money. His mother reluctantly allowed him: "There is no other way....He was meant to help you." The next morning at Watto's junk shop, Qui-Gon pretended that Anakin's pod was his own, and he was entering the race with the sponsored Anakin as his driver. The sleek starship (seen in a projected viewer) would be his entry fee. He also promised: "If we win, you keep all the winnings, minus the cost of the parts I need. And if we lose, you keep my ship. Either way, you win." Watto accepted the "deal." Qui-Gon sensed something about the extraordinary boy "with special powers" - "He can see things before they happen...It's a Jedi trait...The Force is unusually strong with him." Shmi revealed he had no father, and couldn't explain how. Qui-Gon wasn't there to free slaves, but his gamble, if Anakin won the race, would also free the boy from Watto, but unfortunately not his mother. Anakin's midi-chlorian blood count was measured "off the chart" at over 20,000 - rivaling even Yoda's high count. That night, on the eve of the race, a strange spaceship landed in the Tatooine desertscape and a lone figure emerged. It was Darth Maul, pondering the location of the Jedi and Queen. He dispatched Probe droids to three different spaceports glowing in the distance. "Remember, concentrate on the moment. Feel, don't think. Use your instincts...May the Force be with you." When the race began, Anakin stalled his pod, but then soon joined the other roaring pods out on the course to complete three circuits (or laps) around a treacherous course of sandstone formations. The action was fierce, and many swerving racers crashed, sailed off cliffs, were blasted with hot exhaust, or suffered mechanical failures. During the race, Tusken Raiders fired guns at the racers from one of the dune's canyons. Pods exploded or crashed into wreckage and the competition was intense between Sebulba and Anakin, racing side-by-side in the last lap and a half. When their steering rods hooked together, Sebulba's vehicle dug into the ground and brought him to a halt, as Anakin zoomed over the finish line. In addition to winning the race and the money for the starship parts, Anakin also acquired his freedom, and he was told that he was a potential trainee to become a Jedi ("Our meeting was not a coincidence. Nothing happens by accident"), although it would be a difficult and challenging life. His mother bid him goodbye: "My future is here. It is time for you to let go" - she allowed him to leave, to make his dreams come true. After packing, he was sad when the time came to walk away from his mother, and he bravely promised her that he would return to free her too. She advised: "Don't look back." Anakin left the spaceport of Mos Espa with Qui-Gon to join the others at the repaired ship, now heading for Coruscant. Suddenly, Sith Darth Maul (whose Probe droids had tracked them down) raced up on a speeder bike and attacked Qui-Jon with his lightsaber. As they fought, Anakin alerted the ship to take off. It flew low, allowing Qui-Jon to leap onto its ramp and escape, while dark-robed assailant Darth Maul was left on the desert terrain. Qui-Jon knew the attacker was "well trained in the Jedi arts." Anakin was introduced to Obi-Wan Kenobi. Upon the Royal Starship's arrival at Coruscant (where "the entire planet is one big city"), the Queen was planning to meet with the Supreme Chancellor Valorum and Naboo's Senator Palpatine (Ian McDiarmid) in a specially-called session to act upon the Federation's invasion. Beforehand, Palpatine complained that the Senate was composed of only greedy and squabbling delegates "with no interest in the common good." He warned that the Supreme Chancellor had no power with the bureaucrats in charge, and advised a new election (with the Queen's "vote of no-confidence") to choose a stronger leader to control the government, replace Valorum, end corruption, and terminate the conflict. Meanwhile, before a meeting of the Jedi Council in the Jedi Temple, Qui-Gon reported on the mysterious attacker on Tatooine, obviously a master of the Jedi arts and a Sith Lord. The reappearance of the Sith was highly unusual - it was a religious order that followed the dark side of the Force, and was thought to be extinct for a millennium. Senior Jedi official Mace Windu (Samuel L. Jackson) responded: "I do not believe the Sith could have returned without us knowing." Centuries-old leader of the Council - Jedi Master Yoda (Frank Oz) added: "Ah, hard to see, the dark side is." Mace promised to identify the attacker, and added: "May the Force be with you." Then, Qui-Gon also spoke about a "vergence in the Force" - located in the young boy Anakin: "His cells have the highest concentration of midi-chlorians I have seen in a life-form." He was indirectly referring to a prophecy of the one who would bring balance to the Force. He requested that the boy be tested, to see whether he could be trained as a Jedi. Qui-Gon revealed: "Finding him was the will of the Force." Young Anakin was brought before the masters of the High Jedi Council for testing. After deliberations amongst them, he was rejected for training (with the reasoning that he was too old). There were also other concerns: the sense of a clouded future for the boy, and deep fears he had about losing his mother. Yoda had explained: "Fear is the path to the dark side. Fear leads to anger. Anger leads to hate. Hate leads to suffering." Willful Qui-Gon announced that he would train the boy, and make him his second Padawan - but it was forbidden by the Council's code. Nevertheless, he told the boy to watch him and be mindful: "Stay close to me and you'll be safe." In a session of the Senate, the Naboo Queen presented her case about the invasion of her planet, and complained about how her planet's people were suffering, while the Senate was mired in debate. She refused to defer and would not agree to a time-consuming commission to examine her accusations. She called for new leadership and a vote of no-confidence in Valorum. Shortly later, Senator Palpatine was nominated to succeed Valorum as Supreme Chancellor, against two other candidates. The frustrated Queen Amidala elected to return to her planet and her people, although she still vowed to refuse to sign the treaty and was determined to repel the invasion herself. The Jedi Council instructed Qui-Gon to accompany the Queen back to Naboo to discover the identity of the "dark warrior" - "This is the clue we need to unravel the mystery of the Sith." Yoda added: "May the Force be with you." During the trip back to Naboo, the Queen requested help from Jar Jar Binks to request aid from the Gungans. They had recently been attacked at Otoh Gunga by the Trade Federation. Boss Nass and his people had fled to hide in a secret ruined temple - where Jar Jar quickly located them. Queen Amidala proposed forming an alliance with the Gungans, when suddenly, handmaiden Padmé stepped forward and identified herself: "I am Queen Amidala." The young female dressed in the Queen's costume, the Queen explained, was her decoy - her protective loyal bodyguard. After apologizing for the deception, she begged for the Boss' help, and the Gungan leader agreed to an alliance - and to use his army against the Trade Federation. To his astonishment, Jar Jar was appointed Bombad General. The Queen discussed the battle strategy - as a diversion, the Gungan warriors would draw the Battle droids away from the Naboo cities so that they could enter the Theed palace's throne room and capture the Viceroy Gunray. A second plan was to destroy the Trade Federation Control Ship orbiting the planet to sever communications with its droid army. Lord Darth Sidious knew of the Queen's plans, called her "foolish," and ordered: "Wipe them out. All of them." At the Palace: The group of Qui-Gon, Obi-Wan, Anakin, and the Queen's retinue entered the Theed Palace, but were blasted in the courtyard by Battle droids. Inside the main hangar, some of the Queen's pilots were able to jump into starfighters, fly off, and commence an attack against the Federation control ship, while others joined the Queen to approach the throne room. As they neared the location of the Viceroy, the Queen's group was taken prisoner, held at gunpoint, and paraded into the throne room. The Viceroy became confused when the Queen's decoy Sabé shouted from another corridor: "Viceroy, your occupation here has ended." This diversion allowed the real Queen to grab hidden blaster pistols, arm her officers, shoot down all of the Battle droids, and threaten the disarmed Viceroy, now with the tables turned: "Now Viceroy, we will discuss a new treaty." The Ground Battle Between the Gungans and Federation Troops: In the foggy swamp, the troops of the Gungan Grand Army assembled for battle - some of the commanders were mounted on two-legged kaadu and on gigantic lizardlike fambaas (with large shield generators strapped onto their backs). They were fighting against massive numbers of Battle droids. The battle commenced on the green plains of Naboo between the two sides. Soon, the Gungans were overwhelmed when Battle droids pierced the shield perimeter. The Gungan Army were soon forced to retreat and flee from giant floating battle tanks that were chasing them. Surrounded, the Army faced surrender. With the destruction of the Federation's Control Ship in space, however, the Battle droids were deactivated and rendered lifeless and useless. The battle ended. The Lightsaber Duel: Darth Maul appeared and attacked the two Jedi after igniting his own weapon - a deadly, double-bladed lightsaber. As they slashed at each other with their humming swords, the three moved out of the hangar, onto a series of catwalks and then into a narrow hallway filled with electron rays. The ray beams would switch on and off in four shimmering, horizontally-positioned force-field walls, making fighting impossible beyond them when they were activated. Obi-Wan was separated from Qui-Gon by activated beam-walls and watched helplessly, unable to assist. Qui-Gon and Darth Maul fought on inside the Generator Room, and moved towards a large generator melting pit, when Qui-Gon was stunned and then mortally wounded - he fell after he was struck in the chest. When the electron gate opened, Obi-Wan assaulted Darth Maul to defend his fallen comrade, but fell into the deep melting pit. With all his strength, Obi-Wan hurled himself out of the pit, called his fallen Master's lightsaber into his hand, jumped in front of the surprised Sith, and slashed him in half - the two parts of the Sith's body fell into the pit. With his last dying words, Qui-Gon requested that Obi-Wan train Anakin to become a Jedi: "He is the chosen one. He will bring balance - train him." The Space Battle: While in a hiding place in the cockpit of one of the empty starfighters in the palace's main hangar, Anakin (with R2-D2) also decided to roar off into space, and soon joined the tense space-battle already in progress. Anakin's starfighter was hit, spun out of control, and streaked straight into the Control Ship's hangar. After screeching to a halt on its deck, his starfighter was surrounded by Battle droids. He fired lasers, launched two torpedoes, and accidentally hit the Control Ship's main reactor room, causing it to blow up from the inside. Explosions rocked the ship. He flew out of the hangar just in time, to avoid being obliterated in a gigantic blast of flames. The destruction of the control ship simultaneously halted the ground war. The film concluded with the arrival of a large cruiser in Naboo. The Federation's Viceroy was taken away to stand trial for his crimes. Newly-elected Supreme Chancellor Palpatine disembarked, and congratulated Obi-Wan Kenobi for his bravery. He also commended Anakin: "We will watch your career with great interest." He praised the Queen: "Your boldness has saved our people." He promised that together, they could bring "peace and prosperity" to the Republic. Yoda, representing the Jedi Council, bestowed the rank of Jedi Knight to Obi-Wan, yet personally objected to having him train Anakin as his apprentice, although the Council had approved: "The chosen one the boy may be. Nevertheless, grave danger I fear in his training." A funeral was held, and Qui-Gon's body was cremated. Mace Windu spoke to Yoda about the cause of the tragedy - it was created by a "mysterious warrior" who was identified as a Sith. Yoda warned: "Always two there are. No more, no less. A master and an apprentice." Mace asked: "But which was destroyed? The master or the apprentice?" Both of them believed that there was another dangerous Sith who remained, to threaten the Republic's safety. The camera panned over to a side view of Palpatine. A victory parade for the Naboo and Gungans was held - a festive celebration of the Queen's victory in the streets of Theed in front of the palace. Jedi Padawan Anakin, garbed in formal Jedi attire, was standing next to his Jedi Master Obi-Wan. The Queen presented a gift of appreciation to Boss Nass and the Gungans for their assistance. This was the first of a three-part prequel in the series, the first film chronologically, and the fourth film in the entire series. The film was released almost 16 years following the last film of the original trilogy. With the tagline: "Every generation has a legend. Every journey has a first step. Every saga has a beginning." With some of the same characters from the previous films, although in a different time period, earlier in the chronology. The visuals and action sequences were universally praised, although the acting, characterizations, and the screenplay were criticized. Nominated for three Academy Awards (with no wins): Best Visual Effects, Best Sound, and Best Sound Effects Editing. It lost all three nominations to Oscar-winning The Matrix (1999). The film also received seven Razzie nominations, including: Worst Director (George Lucas), Worst Picture, Worst Screen Couple (Jake Lloyd and Natalie Portman), Worst Screenplay (George Lucas), Worst Supporting Actor (Jake Lloyd as Anakin), and Worst Supporting Actress (Sofia Coppola as Sache), and it won one Razzie Award: Worst Supporting Actor (Jar Jar Binks). With a production budget of $115 million, the film grossed $431 million (domestic), $474 million (lifetime domestic gross) and $1,027 million (worldwide). It was the highest-grossing film (unadjusted for inflation) of the entire Star Wars saga, and the 5th highest-grossing (domestic) film of all-time (to date). It was also the highest-grossing (domestic) film of 1999, besting second-place The Sixth Sense (1999) at $293.5 million. It was re-released to theatres in 3-D in early February, 2012. The pod-race scene paid homage to (or ripped-off?) the chariot race sequence in the Circus Maximus in the Best Picture-winning Ben-Hur (1959), one of the most thrilling and famous in film history. Set-pieces: The Boonta Eve Podrace through the rough Tatooine desert terrain, the battle between the forces of the Federation and the Gungans on the plains of Naboo, and the climactic epic lightsaber (laser sword) duel in the Naboo palace between the two Jedi Knights and Darth Maul.